System: Macintosh Originally (1993), PC a year later (1994), 3DO (1995), Jaguar CD (1995), then Saturn, and eventually Playstation. There is also a PSP version of Myst in Japan. Myst is a world of books - like \"The Pagemaster,\" but slower, and for adults. Open a book and you can travel to distant worlds that seem to have been destroyed before their time. You play a traveler, the other, The Stranger, an outsider who has stumbled upon the worlds (or \"Ages\" as they\'re called) of Myst and the D\'ni civilization. Myst is a prison, implied subtly by the still-frame, point-and-click mode of gameplay. But implied very directly by overelaborate puzzles you are forced to endure before your hiatus from the real world, you sincerely hope, ends. You feel constricted here, you don\'t belong in Myst. Basically, all you want to do is get the hell out, maybe go home and have some Espresso, a cold shower. Fat chance. Myst is a strange place, quaint and curious, like that \"Employees Only\" door at Barnes & Noble - what do they do back there, anyway? By scouring the island you learn of four people, Atrus, the husband, Catherine, the wife, Achemar and Sirrus, the two sons. It\'s the two sons you\'ll have the most interaction with, although Atrus will, on occasion, show up in pre-recorded messages, he hoped, to Catherine. Eventually you find two books ? red and blue ? wherein two brothers ? Achemar and Sirrus respectively ? have been imprisoned in what appears to be an exercise of \"time out\" taken too far. It\'s a dilemma for the ages: choosing the lesser of two evils. Sirrus, who is mad, and Achemar, who is explosively evil, say they have intention of helping you. They do promise to send you back to your world, but how trustworthy are their stories? They tell you to bring pages to them, scattered over the Ages of Myst, which will slowly make their extra-book-transmission clearer, and, eventually, free them. At first, you learn through broken conversation that Sirrus was imprisoned by Achemar because Achemar was destroying the lands of Myst, no, Achemar was wrongfully imprisoned by his father after imprisoning his mad brother Sirrus for destroying the Ages of Myst, no, wait, I\'m confused - where\'s the father? Someone is going to get spanked. Neither story entirely checks out, but because you hope they have the power to send you back to your world you have to help one of them. It\'s like \"Labyrinth\" with two David Bowies, or \"The 10th Kingdom\" with two Dianne Wiests. So you choose Sirrus, or you choose Achemar. It doesn\'t matter in the end. They\'re both dead ends. When you find all but one page for each brother, they become coherent enough to tell you of the final page, which is in the library somewhere...okay, it\'s behind the fireplace. They also warn you of another book, a green book, that they say is like theirs, a prison. They warn that if you look at it you will become imprisoned like they are and never escape. Liars. You look at the book but don\'t go in it. Atrus talks to you, apparently imprisoned in a book (that green one) as well. He tells you to bring him the final page of his book and then he can deal with his sons - finally, we have some sweet irony! Bringing him the final page gives you the real ending. If you decide to help either the sons, they\'ll just imprison you in their respective book and tear out pages so you can\'t get out. So if you help anyone but Atrus you get the shaft. One cool effect is that if you happen to go into Atrus\' green book before you give him the last page, you\'ll be actually stuck there and have to reload your save. Myst was one of the first adventures to be featured on CD and one of the most influential graphical adventures of all time. It and The 7th Guest, as reported by Wikipedia, are two large reasons people started buying computers with CD drives. It is, in essence, an adventure-puzzle game, geared at a more mature audience. You don\'t die, you can\'t die. Myst is meant to challenge the intellect and not the itchy thumbs of six-year-olds. And it was, until it was overtaken by the Sims in the late 90s, the best selling computer game of all time, selling over 6 million copies worldwide. This groundbreaking adventure-puzzle gave way to a number of sequels and spin-offs, spoofs, and copycats. Myst is a slow play. It\'s a thought provoker, one that tries, in earnest, to not tell you what to do. Myst lets you discover what needs to happen on your own by giving pieces of the puzzle, not the whole puzzle. This is the real triumph of Myst. The island of Myst functions as a hub through your adventures. As you solve the puzzles on the island, you\'ll discover more books that can transport you to the five Ages of Myst, six if you have the realMyst version. It\'s kind of confusing, but I don\'t really consider the island of Myst as an age of Myst, that\'s redundant. But if you\'re being literal, there are Channelwood, Mechanical, Myst, Stoneship, and Selenitic. If you have realMyst, there\'s also Rime, which is more or less just tossed in there to tie Myst together with other storylines. I remember Myst being unbearably difficult when I was young. I was ten, undaunted by any challenge, but confounded by Myst. \"Confound it,\" I imagine myself saying, \"why can\'t this guy just turn around a little bit! ?\" I remember feeling incredibly cheated with Myst, not being able to get a finger on the solutions, wanting the puzzles presented to me in their entirety instead of in pieces. Eventually, I went through it with the help of a few friends with more patience. Myst was, is, even today, made for a more mature crowd than myself at ten-years-old. In my undergraduate college years, I went through Myst, Riven, and Exile with dorm mates and I found all of them extremely rewarding. Myst is a game that sets standards for subtlety in video games, juxtaposing the need to escape from a foreign world against to two unreliable guides. The game has aged amazingly well in regards to the puzzles. Some puzzles this time around I felt were cheap. Puzzles like not being able to find a way into the Selenitic Age, but realizing that there was a toggle you haven\'t toggled in an accessible, but hard to find, area on Myst Island. Once or twice, Myst pissed me off to no end. Other puzzles, like the sound puzzle in the Selenitic level, or the water pipe puzzle in the Channelwood Age, or the fire puzzle to get into the Channelwood Age, or the puzzle to start the Rocket, and many, many more, are simply brilliant. realMyst ? which I did not, do not, have ? looks way better than the original or my Myst: Masterpiece Edition, with major graphical upgrades so you can look around the world in 3D (like in Exile). realMyst is easily on par with Riven and Exile for detail. But Myst in the Masterpiece Edition retains the old graphics and live acting of the original 1993 release. The acting is solid and fits well with the story, but it has undeniably been shoved under the rug as far as quality of image goes. The sound in Myst had problems originally in the PC release. But the Masterpiece Edition fixed those problems and re-released the game in it\'s oldschool glory. It\'s literally as close as I can come to the original without buying a Mac. Myst was a great game when it came out and that sentiment is still true today. 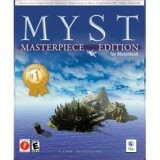 Well, from the Ubisoft store you can find the Myst: Masterpiece Edition that I played. I also found it on Amazon.com for $14.98. It\'s a pretty good deal, except you have to wait for it for like 4 weeks to get it ? unless you pay more for shipping. Filebot has it for a $24.99 download. And GameTap also has all of them for a monthly fee. If you go this route, you also get access to thousands of other games. Pretty cool stuff.